Interstate 95 is a very busy road, especially the section that stretches from Boston down to New York City. If a small child happens to drop something out the window during this section, there is little hope of retrieving it. Many toddler-sized shoes and sandals have been lost along this hurdling highway. Sadly, even stuffed toys have fallen from car windows. But you can’t really blame the little ones. Holding your action figure or your stuffed toy out the window of a speeding car is a great way to pretend that it’s flying. Four-yea r-old Wil Ketcher was thus engaged while traveling with his mom and dad down I-95. 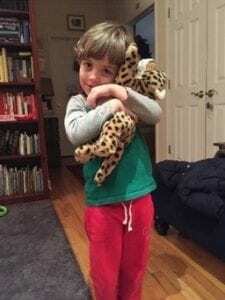 His little buddy, Roger – a foot-long stuffed cheetah toy – was flying through the air at 70 miles per hour. Then, in a moment of distraction, Wil lost his grip on Roger. The little cheetah fell to the dangerous pavement below. Plagued with feelings of grief and guilt, Wil wailed away. But as much as his parents wanted to stop and look for the precious toy, traffic was just too heavy to do so. Dad cooked up some quick comfort by telling Wil, “We’ll write a letter to the Rhode Island State Police. They’ll search for Roger and send him to us.” Dad’s scheme worked. The broken-hearted boy stopped crying and began to think of what he would say to the State Police. Mom admitted later that she only wrote the letter to satisfy her son’s heart. She really didn’t think the State Police would read the letter, much less answer it. And underneath the note laid another stuffed cheetah who could have passed for Roger’s identical twin. In honor of the Rhode Island State Police, Wil named his new buddy, Rhody. It struck me that the Rhode Island State Police must have many responsibilities – a lot of them stressful and dangerous. Yet they took time and found satisfaction in bringing joy to a little boy’s heart. Yet, she thought, “What parent – who’s saddled with concerns of paying the rent and feeding and clothing the children – doesn’t also seek to do the little things for their child?” Sure, there’s mortgage and car payments to be made. Of course, there’s work responsibilities to fulfill. But they do not inhibit any parent from finding joy in giving gifts to their children. In the same way God is never too busy or distracted to hear and answer our prayers. God’s infinite intellect can focus attention on every single atom in this vast universe. At the same time He keeps every galaxy, star, and planet in its proper rotation and orbit. Yet none of this distracts Him from caring for every living creature, from the amoeba to the archangel. Sure, there are huge problems in the world. But that does not inhibit God from finding delight in listening to our prayers and bringing joy to our hearts. God is never too busy for you. “The Lord is like a father to his children, tender and compassionate to those who fear him” (Psalm 103:13). Dear Father in heaven, please open my eyes to the love You have for me. Help me to grasp the fact that, “as a nursing mother cannot forsake her nursing babe and have no compassion on the child of her womb,” so You cannot stop loving me (Isaiah 49:15). Teach me, dear Father, to flee into Your loving arms as my first impulse, rather than as my last resort. Amen.